A couple of months ago I read a great feature article in Pilot Getaways Magazine about a general aviation corridor that allowed general aviation aircraft to fly along the Hudson River to see the skyscrapers of New York City from Window-height. After reading the article I knew I needed to give this flight experience a try. While visiting some family in New Jersey my wife and I had the opportunity to fly along side New York City in a Cessna 172 SP. In looking for places to start this flight from I came across Lincoln Park Wings based at Lincoln Park Airport, a single strip runway in Northern New Jersey. 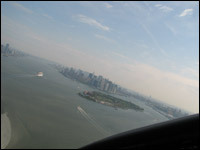 Lincoln Park Wings offers a pre-planned scenic flight of the Hudson River in a Cessna 172 complete with a Glass Cockpit. I mentioned I was a private pilot and they ensured me I could fly the route with the Certified Flight Instructor. This flight would include many firsts for me. It would be my first flight in New Jersey or New York and be my first experience in a glass cockpit. According to Wikipedia a glass cockpit is "...an aircraft cockpit that features electronic instrument displays. Where a traditional cockpit relies on numerous mechanical gauges to display information, a glass cockpit utilizes a few computer-controlled displays that can be adjusted to display flight information as needed." After spending all of my flight time flying with traditional gauges I expected to be overwhelmed by the glass cockpit displays. But, I found them easy to read and relatively intuitive. I can see how it would take 10-20 hours to master the use of the system but after a little over an hour I was starting to understand where I needed to look to find the relevant information. If you have access to a plane with a glass cockpit I would highly recommend checking it out. You can read more about flying a glass cockpit at CockpitMentor. 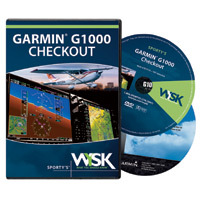 Flying in a crowded airspace such as surrounds New York the features of the Garmin 1000 came in handy. It gave a clear visual image of where the different airspaces were located and helped us to ensure we did not violate any of them. The system also tracks other aircraft and would announce if traffic were near which happened occasionally as there is a variety of helicopter traffic in New York. By looking at the device you could easily determine where the traffic was and then look outside the cockpit to find it and ensure you stayed out of each others path. Many pilots have said that in their early flights in a glass cockpit that they have troubles maintaining their normal practice of conducting visual scans of the horizon for aircraft and get caught up looking at the digital screens. Luckily, having the beautiful scenery of the New York City Skyline ensured I would keep my eyes out of the cockpit. Our flight took us over some beautiful neighborhoods of Jersey and then over the Hudson River just North of the George Washington Bridge. 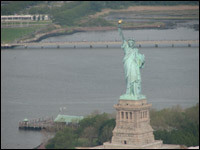 We flew about 800 feet over the river which put us even with many of the buildings in New York. I am familiar with New York but it is seeing New York from this vantage point that really helped me understand what an amazingly huge city it is. Central Park for instance is much larger than I had ever imagined. We had a great view of the Concorde and SR-71 that are on display with the USS Intrepid Aircraft Carrier Museum. After passing by the city for the first time we came up to a beautiful view the Statue of Liberty before making a 180° turn to go back up the Hudson. During the flight I had an enjoyable conversation with the CFI, Michael, who is teaching in NJ over the summer between years at Embry Riddle. I always enjoy the conversations I have when I have an opportunity to fly with other pilots. After completing our scenic tour of New York I flew us back to Lincoln Park, playing with the glass cockpit on the way. 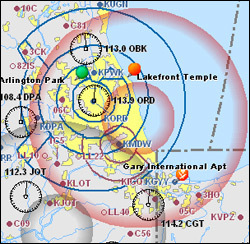 As, I mentioned before Lincoln Park is a small airport with a runway that is less than 3,000 feet long and only 40 feet wide which leaves little room for error on landings. But, despite making my first landing in over a month we made a smooth landing to conclude a wonderful flight. I highly recommend any pilot that has the opportunity to fly the Hudson River Corridor to do it, check out Lincoln Park Wings while you are at it. I put up a gallery of my photos from the flight on Flickr.